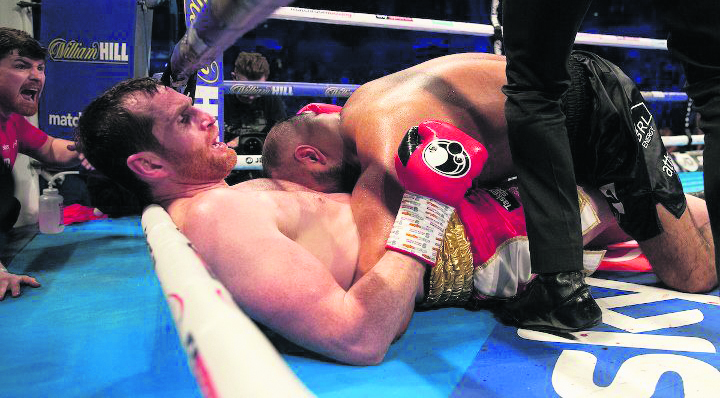 British fighter Kash Ali is facing a lengthy ban and a hefty fine after his disqualification for biting David Price. Price was left with thick, red markings on his stomach after the 27-year-old bit him in the fifth round of their non-title fight in Liverpool. The Liverpool fighter also claimed Ali bit him at least twice in the opening two rounds. The British Boxing Board of Control will now summon Ali to appear before it where his licence will almost certainly be suspended. Ali's purse, which was in the region of £20,000, has also been withheld. The flashpoint in the fifth came after the pair grappled and fell to the ground. While down, Ali, who had earlier been deducted a point in the third for hitting behind the head, sank his teeth into Price just beneath the rib cage. Price could be heard shouting 'he's biting me' to the referee who disqualified Ali. When asked about a possible rematch, Price said: 'I don't want to share a ring with an animal like that again.' Ali, who was previously unbeaten in 15 fights, was pelted with drinks as he left the ring.